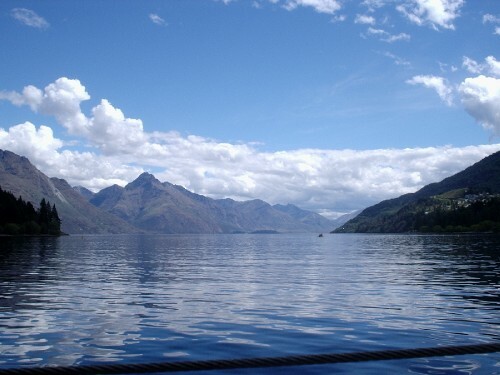 Blog from Queenstown, New Zealand | Margaret in Wonderlands..
We then headed to Greymouth which was going to be a 4 hour drive. We stopped in Greymouth first and headed for Carters beach to have some lunch. It was wild but very pretty the 'sand' was dark grey. We then drove through the gold mining town, there are a lot of those over here. We then headed for Punakaki, home of the blowholes and pancake rocks. The road to it was very similar to the Great Ocean road but the waves broke even further out in the sea it was very wild and beautiful. At the pancake rocks there were several lookout spots including one for the chimney and when the water came up the blowholes you could see little rainbows. The rocks were created from the seabed years and years ago but scientists cannot explain how they ended up layered, like pancakes..It was a gorgeous spot and amazing to see them. I do not think the pictures will clearly show how wild the sea was that day. We also saw a weaker bird in the carpark. He was brown and quite big and had no wings. On the way to Greymouth we passed through Charlestown and Barrytown, good old Irish names. In NZ there is a real mix of Mauri names and Irish and English. When we got to Greymouth we stayed in Dukes which was centred in the middle of town. We went on the Port Elizabeth walk which overlooked the coast line. It was probably a 4km walk so only a small one for that day. The beach was so beautiful, not in a lie on the beach kind of way but just to watch it. The sea was wild and it was covered in grey, blue and white pebbles. When the water came in it looked black it was really something and I have never seen anything like it. We went out for dinner that night to Priyas indian restaurant and me and Jess had a mango chicken and butter chicken and shared it with rice and garlic nann. It was SOOOOO good, I have not had an Indian in ages so I really enjoyed it!! We then headed back to our hostel and into the bar for a few before bed. The girls put some songs on the jukebox as well. The next morning we had a look in a Jade shop. Jade as a stone is really popular here and looks suspiciously like the pebbles on the beach (I did take a pebble the day before for a souvenir) Gez bought some bits. I want to get a bone carving necklace but will buy one later on. We stopped in Hokitika which was a nice little town and had a cute clock in the middle of it. We then drove on and stopped in a few different places. We stopped just off the bridge at the Waitaha reserve. It had a lovely mountain in the background with a river and the white pebbles. The water was really light blue, thats one thing that really takes my breath away here.. how light blue the water is and against the backdrop it is stunning. Me and Gez climbed down to try and get a picture but it really did not capture the beauty and the bridge was too small to go and stand on that. We ended up walking on the river bed. We then stopped at Lake Mapourika which is a black lake north of Franz Joseph. The next stop was Franz Joseph for 2 nights. We arrived there about 3ish and checked into Glow Worm cottages. We had a little room with a little kitchen area and a Chinese guy for company. He spent most the night out of the room, probably intimidated by us :) We drive to Lake Matheson also known as mirror lake and did a short walk but it was not much of a mirror as there were ripples in the water but the mountains in the background made it special. That night we stayed in and I started on my blog again. It so easy to fall behind with this :) Jess and I made some wraps and we had some soup the hostel put on. I had my half day hike the next day @ 10.30 so I wanted to be on top form for that. My hike and hot pools cost me $118. We got all the gear, boots (which blistered the hell out of my feet) jacket, pants and hat and gloves. It was a 10 minute drive to the glacier entrance. The long part was an hour walk across the valley floorbed to the front of the glacier. Especially with painful boots and blisters. There were some gorgeous waterfalls as well. There are only 3 glaciers which are surrounded by rainforest. Franz, Fox Glacier down the road and one in Argentina. Interesting fact for you there. Also the waterfalls used to be twice the size but the ground is rising as more rocks fall down. There was a massive hill like of rocks and stone on the front. A few years ago this was a glacier and they had to make steps but now it's all gravel. We then spent the next few hours walking up the glacier. In and around tracks the guides had laid down for us. There were some tight squeezes and standing on edges which was pretty scary but it was spectacular and I really enjoyed the trip. We only walked half way up and we stopped on some flat for lunch and a quick snack. After that I started to get pretty cold so put on the hoody and jacket and hat. After lunch we did a few loops up there and took some pictures climbing through a small cave. All good fun. It was really scary trying to get down after the cave picture as you walk literally on the glacier edge and you really do put your face in the spikes on the boots as one slip and you are gone. We then started our descent and then it decided to rain but we had been very lucky. We had a steep climb down and had to use the rope for extra help. At least the rain stayed way for the majority of the trip and a group started as we came down. I felt sorry for them. The glaciers do have a lovely blue colour to them and the guide said sometimes you can see orange. There is a lot of dirt on it where the muck comes off the mountains which is a bit of a shame but adds to the effect :) We came back down and had the good walk back to the carpark. By the time we got back I was pretty hot with all the gear on and power walking. I headed back to the cottage and met the girls at 4.30. We then headed for the hot pools. There were 3 pools of 36, 38 and 40 degrees heat. We spent some time soaking them up as they were lush and set in a rainforest backdrop. Later on we headed for the Landing bar for a drink and then to Blue Ice for some shots. Jess and I had sambuca, vodka and midori and it was yummy. Gez had a vodka one. We then had a few vodka and cranberries but the bar was quite quiet. We were playing pool and some lads challenged us so we ended up playing a few more rounds against them and another group of people. It was a good night and we headed home for our 6 hour drive the next day :( All fun but moving moving and more moving. Franz was very much like how I imagine a ski resort would be, it had very cute cabins and was very small. After Franz Joseph we headed to Queenstown. This was the longest drive to date. We had a tea stop in Haast. We then stopped at Lake Wanaka and took some piccies. We did a stop at Lake Hawea as well which was massive and led us all the way down to Wanaka. Here we stopped and I tried a hokey pokey ice cream. Jess had a gold rush. Mine was delicious. Its vanilla with toffee and a NZ favourite :) We had a quick look in the market which was really tiny and then headed off. We did a brief stop in Arrowsmith which is a gold mining town and looks very much like it did years and years ago. The buildings were a bit like something out of a western and were very cute. We then headed for Queenstown which is a gorgeous town (again very ski town like) and surrounded by Lake Wakatipu. It's one massive lake 291sq km with a depth of 378m at the deepest point. There is a population of 13,333 and is deemed as being the adventure capital of the world. Well its where the bungee originated from :) Jess and I were up for doing some activites here. We checked in to Reavers Lodge which was lovely as it overlooked the town and lake so was a great spot. Honestly NZ is stunning, it's such a beautiful country. Some parts could be like Ireland or Tasmania but the mountains are amazing and add on the lakes and beautiful blue water with the white and grey rocks I can see why everyone falls in love with it. I love it and its so untouched. We have been driving lots and passing these little towns but then thats it for a long while apart from the wilderness. The weather has been cooler so far which I expected but not as cold as I can be used to. We strolled around the town and picked up some leaflets. Jess booked her skydive for the next day. I have done one already so wanted to try something different. We then had a legendary Fergburger which was AMAZING!! It was massive and tasted sooooo good. We even topped it up with some chips. After a full stomach we headed to book our trips.I opted to book a Jetboat ride with Gez and Canyon swing for the Monday, the gondola which takes you to the top of the mountain overlooking Queenstown and 5 luge rides at the top on Tuesday morning. All costing me $340 which I thought was a good price. I was debating the canyon swing but i really wanted to do it.. well it's a once off. I did not think I could do the bungee, don't ask me why. This is 109metres high and the bungee is 134 so not to far behind and I still have to decide how I jump off.. There are apparently 70 different ways to do the jump which has a 60m freefall at 150kph and a 200m swing and is the world highest cliff jump. Oh sweet lord why do I sign up for these things. I guess I like pushing myself to the limit and pusing the fear factor but I love the rush of these crazy things. It was annoying as I missed the last spot at 12pm so I booked the jetboat for 2.30 and then the canyon swing at 5.30 but it can take up to 2.5 hours. The jetboat takes you down the shotover river canyons and they do full 360 degree spins near rocks so it looks like great fun. I think I will do white water rafting in North Island but then I could spend a lot on all these activites. I am spending money VERY quickly here in NZ and its slightly cheaper then Australia so I need to be a bit careful. Dorms and triples have been costing us about $25-30. All expensive so roll on SA for some cheapness. I was well up for a night out the next night so it would now be a bit of a rush but oh well, it's the way it was meant to be. We got home about 8ish and chilled ready for the next day. I completed most my blog for the end of Fiji and NZ.